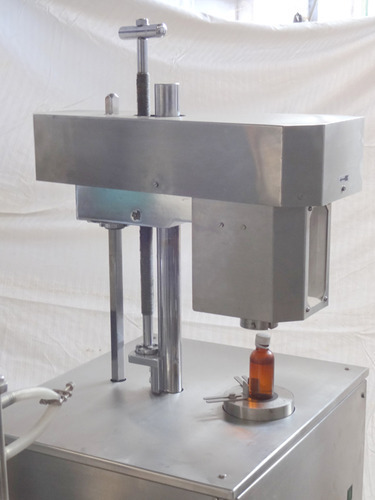 Semi Automatic Screw head cap Sealing Machine is used for capping of pet bottles and glass bottle with plastic screw cap . precision built on robust welded steel frame entirely enclosed in doors and stainless steel sheet are provided to allow the servicing of machine. The machine is instilled with having motorized revolving head mechanism, which makes sure proper cap sealing with uniform torque. Elegantly designed cabinet covered with S.S outer cover, this machine require manual feeding & unloading container The machine is equipped with an electric motor with suitable gearbox that makes it ideal for heavy liquid up to 1000 ml.